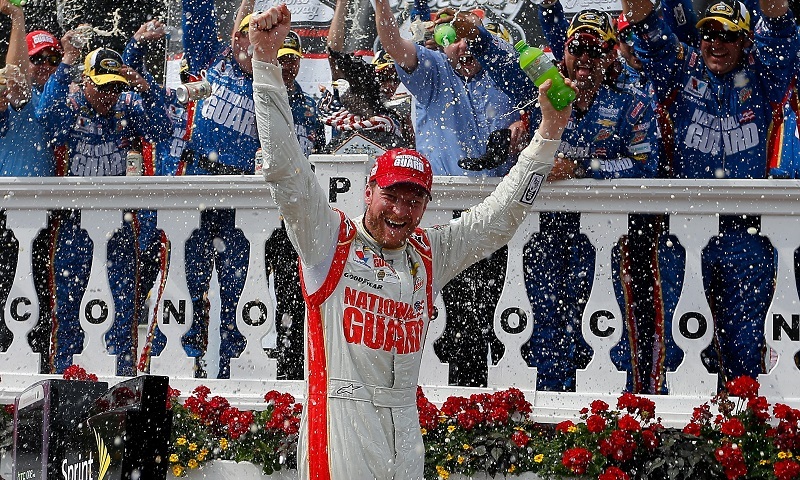 As I continue to reflect this week on the impending retirement of Dale Earnhardt Jr. from the Monster Energy NASCAR Cup Series, I found several ‘Junior Moments’ that stick out in my mind and will leave a lasting impression. One specific one goes back to 2014 and a Sunday in the Pocono Mountains that my father and I will never forget. There aren’t many things ‘normal’ about growing up as a diehard race fan. Sundays don’t always include a rigid schedule of church, afternoon lunch and family dinner. It generally doesn’t include a round of 18 holes on a beautiful Sunday afternoon, nor does it include Sundays full of NFL coverage and watching the ‘Red Zone’ channel in the fall season. No, when you’re a race fan, Sundays include watching FS1’s pre race show to get filled in on all the things that happened at the track before the big race takes the green flag. Sundays include appointment television to watch NASCAR and constantly monitor where your favorite driver is in the running order throughout the day. As a race fan, your Sunday itinerary revolves around the green flag and checkered flag of the NASCAR race. But when you’re a diehard, even special events and holidays carry a racing theme. My father and I aren’t the kind of guys that go golfing on birthdays or Father’s Day. We don’t fish and we don’t own guns to go hunting. We go racing, either with our own RC cars or we go watch others put on a show at the local dirt tracks here in the Northeast. 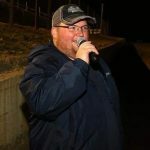 In fact, Weedsport Speedway has made a small fortune from our family spending these occasions at the track watching the Super DIRTcar Series, World of Outlaws Craftsman Late Models and World of Outlaws Craftsman Sprint Cars. But back in 2014, I made the executive decision that we were going to celebrate the Father’s Day occasion (Father’s Day was actually one week later) watching racing of a different brand. Dad had never been to Pocono and neither had I. We had many friends and family that had been to Pocono and always recommended it. So that year, I decided I’d take dad to Pocono to cheer on Dale Jr. at the ‘Tricky Triangle’. Ticket prices were fantastic and anyone that ever complains about ticket prices at Pocono needs to have their head examined. We found some really reasonable prices for seats in Turn 3 and had to pick up a FanVision rental to listen in to the action. If you go to a race and skip the FanVision or scanner rental, you are just flat out missing out! We had a great trip down to Pocono, only driving about three hours from home to get there. We found our seats and settled in for what we hoped would at least be a great race regardless of where our favorite driver finished. As the race wore on, we quickly realized that it could turn out to be pretty special by time the checkered flag was displayed. Earnhardt was closing fast on Brad Keselowski, who had trouble with debris on the grill of his Penske No. 2. With Keselowski trying to clean the grill off and getting caught up behind Danica Patrick in traffic, Earnhardt made the race-winning move with about five laps to go. Talk about drama and excitement! Those last four and a half laps were the longest laps I could remember watching in-person. The crowd in our section was going absolutely crazy, as we lucked out to be sitting near a bunch of other members of Junior Nation.